Gulf Coast Seafood with Chef Reggie $65..
Thursday August 22, 2013 from 7:00 PM to 9:00 PM CDT Join Executive Chef Reginald Martin for some of his favorite Gulf Coast cuisine. 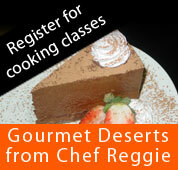 The evening will include a three course meal with behind the scenes look at Chef Reggie in action. Includes wine. 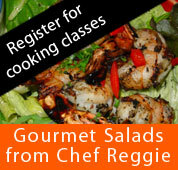 Knife Skills 101 with Chef Reggie $40..
Saturday August 24, 2013 from 9:00 AM to 11:00 AM CDT Chef Reggie will teach you how to handle a knife like a pro. You will practice on various food items to sharpen you techniques. Includes lunch. Gourmet Soul Food with Chef Reggie $50.00..
Thursday September 5, 2013 from 6:30 PM to 8:30 PM CDT Join Chef Reggie for new twist on traditional soul food. Menu will include Pecan Crusted Chicken an other Lemond favorites. Wine Included.